for this picture of their water dragon! Water Dragons, also known as Chinese Water Dragons, Asian Water Dragons, Thai Water Dragons or even Green Water Dragons is an agamid lizard from Asia and Southeast Asia. These beautiful creatures have very specific care requirements that include higher humidity and larger enclosures. They grow up to 3 feet, or more in length and require a habitat that suits their needs. They do best on a varied diet and get bored quite easily so having a varied selection for them to chose from and rotating what you feed them is important. They are extremely fast moving lizards and require, no surprise, water in their enclosure. One interesting fact about them is that they can submerge themselves for long periods of time under water. 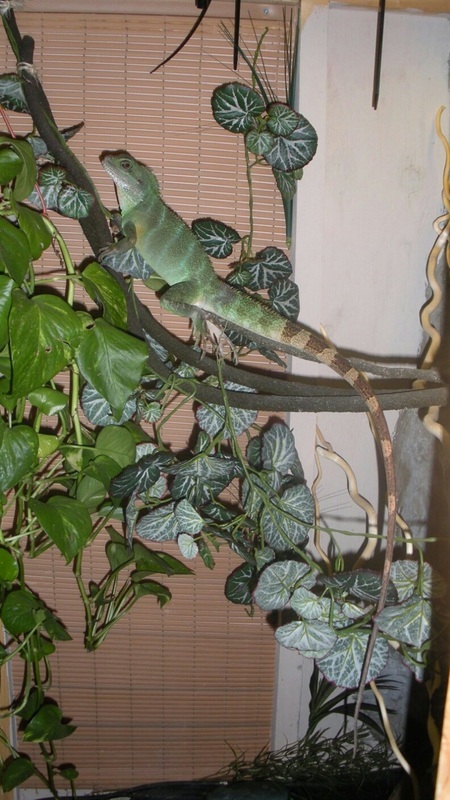 Tricia's Water Dragon Page is an amazing resource for the care of water dragons. The link is below is to her site that is dedicated to their care. It has been an invaluable tool for anyone wishing to get a Water Dragon. Her listserv is another great way to connect with other water dragon owners and ask questions. This links to a forum for Water Dragon care that can be very helpful.